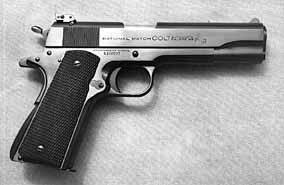 This is an example of the Colt National Match 1911 pistol. The National Match pistols were available in both .45 ACP and .38 Super. The National Match guns are found with 5″ barrels and blued steel and stainless steel models. Eight round models were standard in .45 ACP and nine round mags in 9mm and .38 Super.